It’s official: Vladimir Putin stole the US election. Now what do we do? 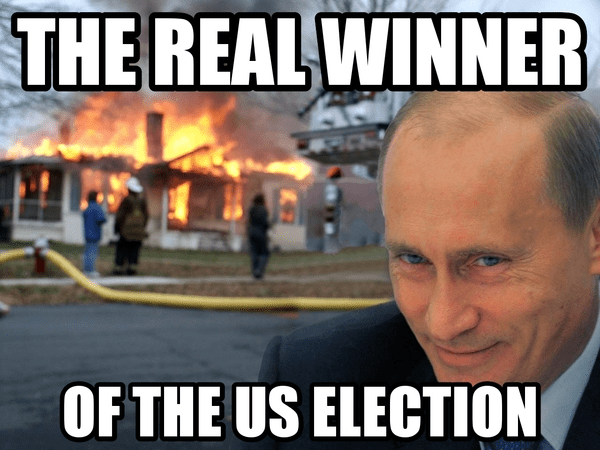 I guess some congratulations are in order for one Vladimir Putin, the Russian kleptocrat who used strategic leaks of hacked information to win the election (or at least the electoral college) for Donald Trump, a thin-skinned narcissist and easily manipulable geopolitical naif. I mean, we knew that before. But now it’s pretty much official. Yep, that’s right. The outcome of our election was essentially determined by a hostile foreign power — with the active encouragement of Donald Trump, the candidate who benefited from Russia’s interference. It’s also now clear just how selective Russia’s use of hacked information was. The New York Times reports that the Russians also successfully hacked the Republican National Committee’s email servers, but chose not to release any of these emails. No wonder Trump is skipping most of his intelligence briefings. Some people are comparing these revelations to Watergate. I don’t think that’s fair. This is ten times more significant than Watergate. It calls the whole election into question. Trump is not our President. And he should not be sworn into office unless and until we have a full public reckoning of how exactly he “won” this election. That is some really good ‘shopping, wow. I know, I was really impressed by the attention to detail and color matching. Excellent work, whoever made that ‘shop. Seconded! Few people go the extra yard to add in reflections to something like that. I intended to address every person’s response to my comment, was kind of excited to even, until I saw your comment and realized people were assuming I was a troll apparently. I don’t even know what a Mrex is. I really am a feminist (and a woman, I’m white but I’m not a middle-class white man), I really do believe she was flawed when compared to Bernie NOT Trump. Obviously Trump is horribly flawed, I didn’t think that needed to be said. I watch The Young Turks and read The Intercept so I’m not just spouting stuff I heard on TV (and now I feel the need to also say I am not trying to brag about how progressive I am I’m just giving examples). I’m new to politics and this is the first election I’m really paying attention to other than passing headlines. I was just attempting to share my opinion that if we keep with the status quo we may be in for more Trump/Trump-like presidents (which is obviously bad) because people want change. I guess I should have left it at that. I hope this comment won’t be misinterpreted as well. Hopefully, probably naively so, we won’t always need to “hold my nose” to vote.